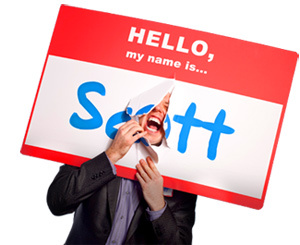 How to Create a COOL Company Name - HELLO, my name is Scott! The cashier swiped my credit card. She looked closely at the name. ‘Oh, that’s the name of my company,’ I smiled. She furrowed her brow and tilted her head. ‘Are you serious?’ she chuckled. She handed the card back to me. I thanked Susie for her help and headed out to my car. 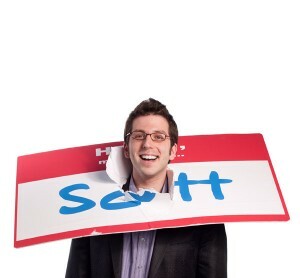 And by the time I got back to the office, the lesson was obvious: cool names work! Smart. Fun. Eye catching. EAR catching. HERE’S WHY: In a world of infinite choice, it’s impossible for customers to keep all those company names straight. That’s why you need to try extra hard. Because the world is crying for uniqueness. SO, HERE’S YOUR CHALLENGE: when naming your company, make it cool. Because monograms are NOT brands. 2. You’ve broken their patterns. 3. You’ve attracted their attention. And the best way to capture someone’s attention is to B-R-E-A-K their patterns. What’s more, you’ve created a hint of anxiety in the air. And this is the best time to give someone new ideas. SECOND, you articulate your company’s value. Your USP. Your value statement. Your positioning statement. Make sure it’s clear, concise and emotional. No more than ten words. Leave no doubt in the other person’s mind what you do and how your company delivers value. JUST REMEMBER: Surprise attracts attention, but only interest keeps attention. At this point in your conversation, you’ve already attracted someone’s attention. You’ve already delivered your value statement. You’ve heard of the ‘Aha moment,’ right? Well, the challenge is framing your conversation in a way that supports it. That’s the magic of these three steps, when used properly. Huh?, then value, then Aha! 1. You become awfully hard for her to resist. 2. You become awfully hard for her to forget. 3. You becomes awfully hard for her (not) to tell other people about. AND LET’S FACE IT: the only time companies are successful is when people are actively and positively talking about them. If you break patterns, you get noticed. If you get noticed, you get remembered. If you get remembered, you get business. Do yourself a favor. Get a cool company name. What’s the coolest company name you’ve ever seen?